One of the main goals of CEDEF is spreading public awareness of the rational and responsible behavior to increase energy efficiency and stimulate greater use of renewable energy, so that the publicity and visibility in the media one of the most important aspects of CEDEF activities. In order for CEDEF to educate the public about the necessity of increasing EE and RES, it has built and nurtured a very successful cooperation with more than 30 media companies. The media is an indispensable partner in spreading awareness with CEDEFa to the general public about the necessity and importance of rational and responsible behavior when using energy, as well as changes in habits in daily life. Therefore since 2010 one of the key activities of CEDEF and media organizations is holding a prize competition on different topics in the field of EE and RES. Competitions are organized in cooperation with the Association of Journalists of Serbia (UNS) and the Independent Journalists Association (NUNS), as well as with relevant ministries, agencies and organizations, and sponsored by successful business whose work is based on corporate social responsibility which promotes increase in EE and greater use of RES. CONTEST with the theme of "Gaining Energy passports via greater insulation""
In cooperation with the Association of Journalists of Serbia, UNS, and the Independent Journalists Association of Serbia, NUNS, under the auspices of the company CERESIT, CEDEF held a prize competition for the best journalistic media apiece entitled "Gaining Energy passports via greater insulation". The aim of the competition was improving public awareness in public and aong industry about the importance of insulation as one of the key factors for energy efficiency in buildings. The building sector is the most demanding energy sector in Europe and Serbia referred to more than 40% of total energy consumption. During the panel discussion participants have presented examples of good practice and provide practical advice for achieving energy savings via insulation. Insufficient insulation leads to increased heat loss in winter, overheating rooms flying, as well as damage caused by condensation. By improving the insulation performance of a building, it is possible to achieve a reduction in total energy losses in average by 40-80%. In Serbia there are about 3 million different buildings with average energy consumption 150 to 200 kWh per square meter per annum, while in the European Union that consumption is between 50 and 70 kWh. "Municipal waste as an energy source"
Central-European forum for the development CEDEF in cooperation with the Agency for Energy Efficiency Republic of Serbia, under the auspices of the Global Intercontinental Utilities BGD Ltd. organized a journalistic prize competition for the best media contribution on "Municipal waste as an energy source". The idea was improving public awareness among business and industry about the importance of waste as one of the key energy resources today. Starting this issue is even more important when we know that we live in an era of scarcity of fossil products. At the panel discussion, it was pointed out that municipal waste as an energy source, reducing dependence on fossil fuels, reducing the required capacity of landfills for more than 95 percent and allows revenue from sale of energy produced in this way. Germany has 6,000 system for production of heat and electricity from municipal waste, while in Serbia built only a few objects that have this purpose, thus obtaining this form of energy has just started. Therefore, the improvement of energy efficiency by using waste should be given special attention. "The insulation in buildings and energy efficiency"
Central-European forum for the development CEDEF in cooperation with the Agency for Energy Efficiency Republic of Serbia under the auspices of Henkel organized a journalist prize competition for the best media contribution on the theme: "The insulation in buildings and energy efficiency" in order to inform the public and the industry of importance of insulation as one of the key factors of energy efficiency in buildings. During the panel discussion it was pointed out that the energy consumption in buildings of any kind, including housing, going a total percentage of maximum energy of the total energy consumption in many countries, and an average of up to 60%, while in Serbia 39 - 42%. Therefore, the improvement of energy efficiency in buildings is necessary to give special attention. Energy efficiency in buildings involves the efficient use of energy with the use of optimal measures aimed at: reducing energy consumption with financial savings for the end user, comfortable and quality living in the building, reducing maintenance costs and prolong the life of the building, contribution to environmental protection and reduced emissions of harmful gases as well as global climate change. 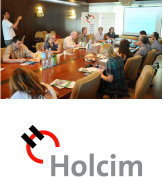 In cooperation with the Agency for Energy Efficiency Republic of Serbia under the auspices of the company Holcim, Central European Development Forum, CEDEF, launced journalist prize competition for the best media contribution on "Alternative fuels in the industry." 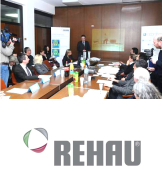 The aim of the contest is to promote public awareness in industry and with the regulators about the role of alternative fuels in industry, as well as the importance and effects of alternative fuels in the industry. The reasons for the use of alternative fuels are numerous and some of them are: conservation of fossil fuels, reducing emissions of toxic gases and the development of economic activities in waste management. The panel discussion highlighted the importance of the role of alternative fuels in industry, as well as the importance and effects of their use. In the EU alternative fuels participate in factories with 18%, which makes reducing the use of coal more than 5 million tons, and the reduction of CO2 emissions by as much as 8 million tons per year. By some estimates, annually Serbia generates 625,000 tons of secondary raw materials suitable for the preparation of a solid renewable fuels. All cement plants, heating plants and other plants that use coal as the primary fuel, they could complete the settlement of its energy needs with alternative fuels. 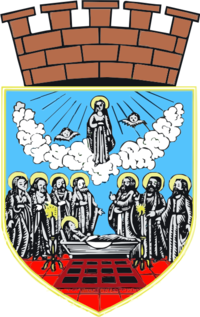 Serbia then generally would not require coal, and replacement of primary fuels would not only reduce the consumption of non-renewable natural resources, but it would free the unecological waste landfills. "Windows - the first step to energy efficiency"
Central European Forum for Development - CEDEF in cooperation with the company Rehau and Energy Efficiency Agency of the Republic of Serbia announced a journalist prize competition for the best media story on the topic: "Windows - the first step to energy efficiency" with the aim of improving public awareness about the importance of the economy as a window one of the key factors for energy efficiency. Panel discussion deals with an extremely important aspect of energy efficiency - windows. This seemingly everyday term is predominantly important for every household, industry and the overall energy efficiency of the whole state. Windows are the biggest "spenders" through which huge amounts of expensive energy is lost. They are, as the world statistics show, the first step towards energy efficiency which are undertaken by major industries and households and thereby achieve savings of up to 40%. Providing or replacing windows by energy efficient ones are the simplest method to reduce bills for heat and electricity and has just taken the first step due to the simple procedures that require in relation to other ways of introducing energy efficiency. The first prize of this contest received Senka Lucic journalist "Politika"
Third prize - Zorica Stanojevic Lešović – Cacanski Glas, Mladen Vuksanovic – Zelene vesti, Dragan Kolarov - Green Magazine and Aleksandar Bozovic - RTS. 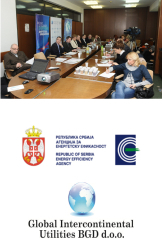 In cooperation with the company Henkel and Energy Efficiency Agency of the Republic of Serbia, Central European Forum for Development, CEDEF, organized a competition for the best media contribution in the field of raising public awareness and industry about the importance of energy efficiency. At the panel discussion, it was pointed out that every year are implemented numerous activities in the field of energy efficiency with the aim of raising awareness about the importance of rational energy consumption and the importance it has for the sustainable development of the entire region. Energy efficiency means a series of measures taken to reduce energy consumption, and that when it does not impair the conditions of work and life. The goal is to reduce energy consumption to a minimum and to maintain or increase the level of convenience and comfort. While energy conservation always involves certain sacrifices, efficient use of energy leads to an increase in quality of life and greater competitiveness of companies and the economy and eneregeskoj security. The result of increased efficiency in energy use are significant savings in financial terms, but also better working and living environment. Fourth prize - Boban Trajkovic, PG Network; Zorica Lešović Stanojevic, Cacanski Glas; Dejan Spalović, Politika. Bojan Kovacic, deputy director of the Energy Efficiency Agency of the Republic of Serbia, who was also the chairman of the jury. 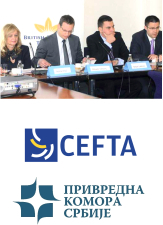 Within ,CEFTA week 'which was held during November 2010 in Belgrade, Central European Forum for Development and Serbian Chamber of Commerce organized a journalist prize competition on the occasion of Serbia presiding over CEFTA Joint Committee. 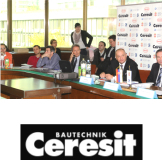 The prize competition was organized for journalists who best reported on CEFTA. The ceremony was organized in two categories: print and electronic media. The prize-winning journalists had the opportunity to visit one of the CEFTA countries, while the winners of the second and third prizes were presented plaques. At a panel discussion participated: Mihajlo Vesović, vice president of Serbian Chamber of Commerce, Vesna Arsic, State Secretary for Foreign Economic Relations, Ministry of Economy and Regional Development, Borislav Injac, Assistant Director of the Customs Administration, and Srdjan Lazovic, Director of Corporate and Regulatory Affairs British American Tobacco BAT. In the print media category, the first prize was given Vesna Lapčić magazine "Preduzece"